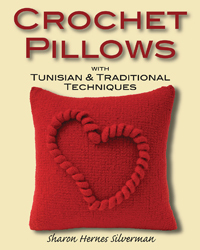 Crochet Pillows with Tunisian & Traditional Techniques takes making pillows to the next step by including techniques like weaving, beads, cross stitch, and felting. Half of the designs are made using traditional crochet while the other half are made using Tunisian crochet. Each pattern provides detailed, well defined color images where needed thal allow you to easily see what is being done. In all there are almost 270 color photos in the book. The pillows cover a range of sizes and shapes, as well as different stitches, including waves, mitered squares, cables, spikes, and more. The back section of the book provides instructions on both the traditional and Tunisian crochet stitches so if you’ve never tried Tunisian crochet, you’ll find a good overview of the technique to get you started. Check out a preview of the book at the publisher’s web site.